Villa del Capitano Art & Relais is located on the main street of the old Medieval town centre in San Quirico d'Orcia, next to the old walls. This elegant mansion, together with Palazzo del Capitano Wellness & Relais and Dimore del Capitano, is part of the Capitano Luxury Hotel Collection. The three structures are all close to each other. A Neoclassical period mansion, Villa del Capitano Art & Relais is an elegant boutique hotel with bright and spacious communal areas. Most of the rooms have a balcony offering stunning views over the valley; decorated with exclusive works of art, they provide guests with a memorable stay. Set within the beautiful natural surroundings of Val d'Orcia, the building offers a perfect blend of Tuscan tradition and modern art. 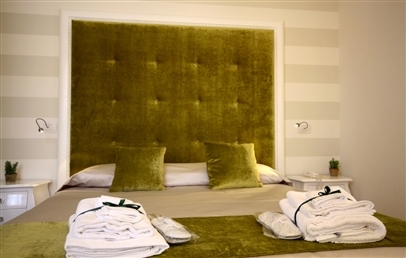 Classic – 20 sqm, double room with bathroom with shower, air conditioning and Wi-Fi. 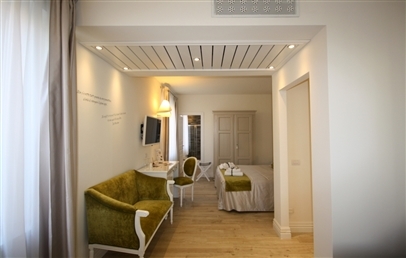 Deluxe – 30 sqm, double room with bathroom with shower, air conditioning and Wi-Fi, balcony. Suite Prestige – 45 sqm, double room with lounge area, terrace or private garden. Rooftop Wellness Suite – 45 sqm penthouse + 60 m2 terrace. Hydro-massage bathtub with chromo therapy lamps in front of the fireplace. Terrace with hydro-massage and chromo therapy swimming pool, solarium, lounge and relaxation area. "La Grotta di Venere" Spa, part of the Capitano Hotel Collection, is in the Wellness Wing of Palazzo del Capitano Wellness & Relais, just a few steps from Villa del Capitano. Its outstanding facilities allow guests to relax and enjoy every moment of their spa experience. 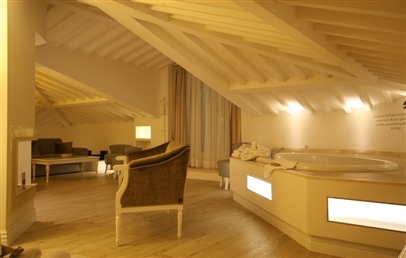 La Grotta di Venere can be booked for private use and provides a wide range of body, facial and massage treatments. We recommend that guests book their treatments before their arrival. All beauty and treatment products can be found at the Boutique dei Profumi in Via Dante Alighieri. Antica Trattoria Toscana Al Vecchio Forno, next to Palazzo del Capitano Wellness & Relais, is the restaurant of the Capitano Luxury Hotel Collection. It offers excellent traditional local cuisine and the chance to experience the authentic flavours of Tuscany. In spring and summer, meals are served in the romantic garden, while in winter guests can enjoy dining inside in front of a blazing fire. The Lounge Bar with ambience music, located in the elegant Salone Madama at the entrance to Villa del Capitano Art & Relais, is ideal to enjoy an aperitif or relax with a drink after a long day spent exploring Tuscany. Palazzo del Capitano Wellness & Relais offers a number of services that are available also to Villa del Capitano Art & Relais guests. These include restaurant service, a lounge bar and the boutiques in Via Dante Alighieri. More information is available on this page. Double bedroom with travertine marble and en-suite bathroom with shower. Air conditioning and Wi-Fi connection, LCD TV with digital and satellite channels. Double bedroom with balcony and travertine marble en-suite bathroom with shower. Air conditioning and Wi-Fi connection,, LCD TV with digital and satellite channels. The suite comprises a lounge, double bedroom, terrace or private garden. Travertine marble bathroom with shower. Air conditioning and Wi-Fi connection, LCD TV with digital and satellite channels. The suite is located in the penthouse of the Villa. It comprises a lounge, double bedroom, a hydro-massage bathtub for two with chromo therapy lamps in front of the fireplace. It features a large terrace with hydro-massage and chromo therapy swimming pool and fantastic views over the Val d'Orcia. Lounge and relaxation area. Travertine marble en-suite bathroom with shower. - 10 % reduction at the Restaurant Antica Trattoria Toscana "Al Vecchio Forno"
- 10 % reduction at the Boutiques "del Gusto" and "del Profumo"